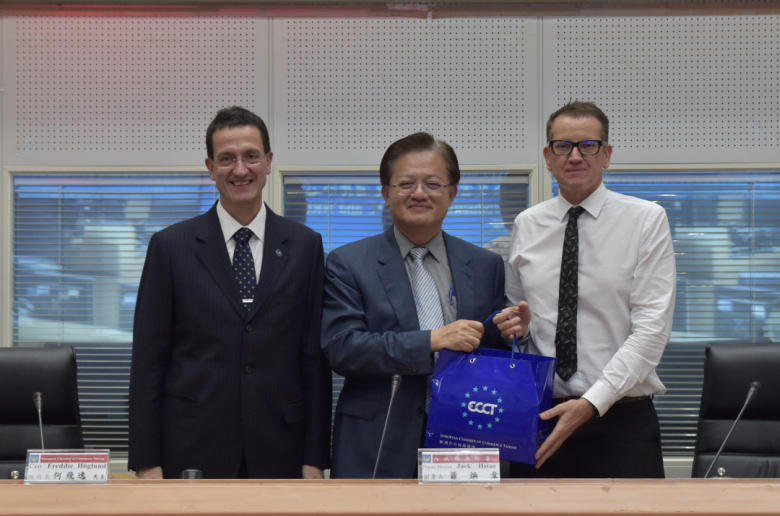 The ECCT's Better Living committee arranged a visit to the Central Emergency Operation Center (CEOC) in the Xindian District of New Taipei City. At the event Dr Hsiao Huan-chang, Deputy Director-General of the National Fire Agency under the Ministry of Interior (MOI), gave an introduction to the CEOC. Deputy Director-General Hsiao began with opening remarks, after which guests watched introductory videos about the CEOC and the National Rescue and Command Center (NRCC), which explained the standard operating procedures for handling specific scenarios such as typhoons, earthquakes, floods, fires and other common calamities in Taiwan, such as emergency rescue in remote areas. After the videos, Dr Hsiao answered questions from ECCT members and guests. Among other topics, guests learnt which agencies and resources are mobilized for specific scenarios and how activities are coordinated by the CEOC to ensure effective responses to various emergencies. The permanent centre in Xindian was set up in order to deal effectively with natural disasters and other events which require an emergency response. The CEOC falls under the authority of the Ministry of Interior’s National Fire Agency (NFA), which is the agency responsible for disaster prevention and response in Taiwan and for coordinating disaster response efforts among other agencies such as the MOI, the Ministry of National Defence (army, navy and air force), the Ministry of Transportation and Communications (MOTC) and the Council of Agriculture (COA). It is also the agency responsible inspecting and approving the safety of buildings in Taiwan and dealing with toxic chemical materials. There are three levels of emergency response services: at the national, municipal and village level. Personnel are on standby 24-hours a day and 365 days a year. The CEOC normally only has a small staff on hand to monitor all media channels, answer emergency calls and respond to disasters. In the event of a major disaster (Classified as a Class 1 or 2 disaster), an emergency SMS is immediately sent to a full contingent of officials from all relevant government ministries and agencies to summon them to convene at the CEOC. Officials are expected to arrive within one hour of being summoned. Those summoned include separate teams to handle administrative, communications, operations and logistical support and 20 other functional groups to handle rescue and relief efforts. The NFA uses an emergency management system and disburses information (updated frequently) to various government agencies for their websites and to the media. Preventative evacuation is the preferred option for disaster areas wherever possible. Helicopters are dispatched if necessary to survey disaster areas and collect the information necessary to draw up disaster evacuation and relief plans, which are then implemented by local emergency medical technicians, the police or the military (depending on the type and scale of the emergency). If local teams on the ground are not able to cope with the scale of the disaster, assistance is dispatched from other areas. Once the emergency is under control, the CEOC assists with providing longer-term support such as providing housing for victims of natural disasters such as fires, floods or landslides. After securing the safety to victims, the next priority is the restoration of power and water supplies, repair of roads and long-term reconstruction efforts, which are taken over by local authorities. The NRCC coordinates rescue operations, drawing on the aircraft, ground vehicles, marine vessels, personnel and other resources from the MND, MOI, MOTC, the police and the Coast Guard together with the NFA’s search and rescue teams. Police are deployed to control disaster-hit areas and the Civil Aeronautics Administration (CAA) provides navigational support to help in rescue missions. The NRCC also coordinates with international agencies and counterparts in other countries to conduct search and rescue missions and dispatch humanitarian aid. Emergency personnel undertake ongoing training and joint exercises with local and international experts in order to improve their skills. In answer to a question as to the various emergency numbers in Taiwan (110 for police and 119 for fire or ambulance services), Hsiao explained that callers will automatically be directed to local emergency service operators in the area where they are dialling from and that operators are able to redirect calls to the appropriate emergency responders and to operators who can speak English if necessary. In answer to a question as to how the CEOC would continue to operate in the event of a power failure, the CEOC has back-up generators able to provide power for up to seven days. Moreover, the CEOC has two alternative locations in Kaohsiung and Nantou, if needed.